A brigade of basset hounds leads the parade on the wet Boardwalk. But the 34th annual Doo Dah Parade took place on Saturday afternoon despite forecasts of possible showers. As the parade kicked off at noon on Sixth Street in Ocean City, there were some concerning dark clouds, but no reported raindrops just yet. The parade included performers and musicians such as the Ocean City High School Marching Band, the Pleasantville High School Marching Band and the Hobo Band. 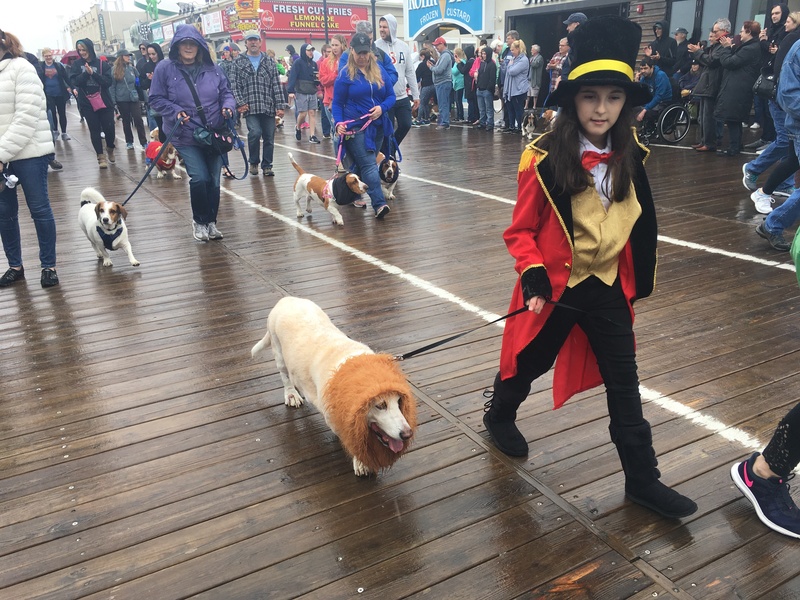 The 2019 Ocean City pageant winners were also in attendance, along with a herd of basset hounds making their annual appearance. 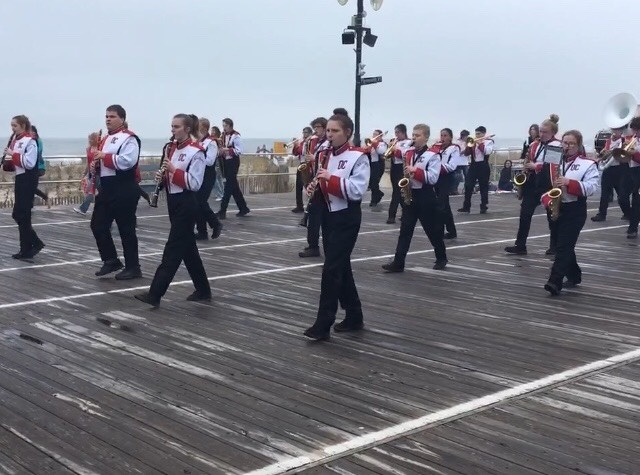 The Ocean City High School Marching Band plays some lively music while heading down the Boardwalk. As the parade rounded 12th Street and headed towards the Boardwalk, the rain began to fall. While some parade-goers found shelter under gazebos and Boardwalk shop awnings, others came prepared with umbrellas to watch the celebration. The rain didn’t seem to hinder the experience, however, as the Boardwalk crowd was only slightly smaller than it has been in previous years. Spectators continued to dance along with the many bands and mascots the Doo Dah parade has to offer. “We hoped it wouldn’t rain, but we brought an umbrella just in case,” said Kate Fischer, 24, of Ventnor, as she huddled under her umbrella with boyfriend Nick Price, 25, also of Ventnor. “I wish we brought two,” Price joked. Eden’s renowned humor made her a fitting choice as the Doo Dah host for the comical parade, city officials said. She was also slated to serve as host for the Mr. Mature America pageant Saturday night at the Ocean City Music Pier. The parade concluded on the Boardwalk on Sixth Street as planned. Although the participants were a little wetter than at the beginning of the day’s festivities, it was all smiles and laughter for the end of another Doo Dah day in Ocean City. 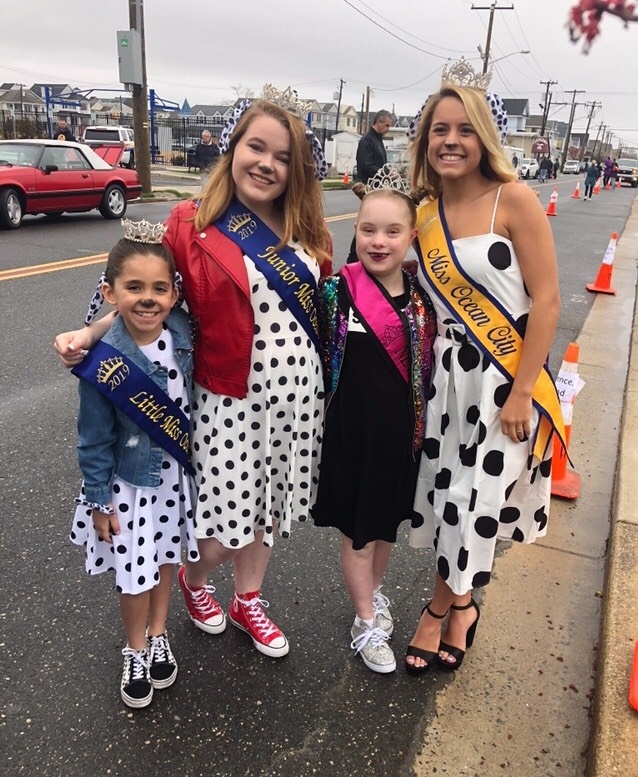 From left, Little Miss Ocean City Stevie Wright, Junior Miss Ocean City Julia Wilson, Miss Amazing New Jersey Junior Teen Chloe Byrne and Miss Ocean City Megan Keenan get ready for the parade.